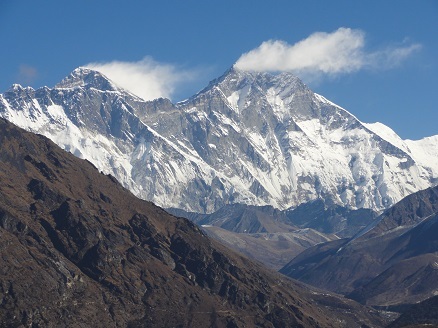 The Khumbu is the Everest area, starting at the West with the frontier with the Rolwaling area, ending at the East close to the Island peak, between the frontier with Tibet at the North and the village of Namche Bazar at the South. It includes the Sagarmatha National Park. - At the extreme East, the Chhukkung valley gives access to the Island peak. 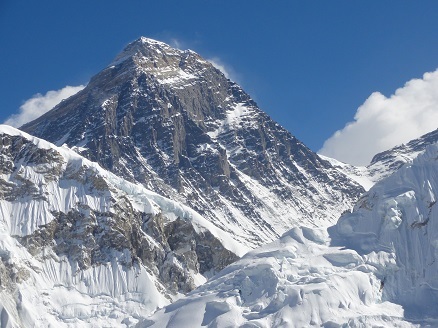 Nuptse, Lhotse, Island Peak, Ama Dablan, Makalu give an extraordinary scenery. 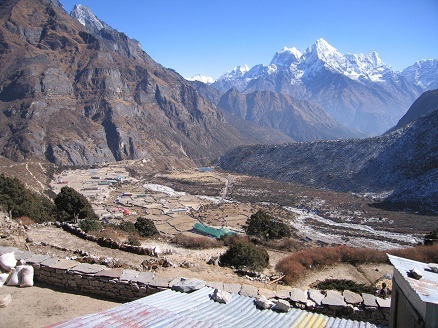 The Chhukkung Ri trekking top at 5550 m is the best place to go to have the best view point of this valley. For more experienced trekkers, Island Peak at 6189 m, could be a great challenge. 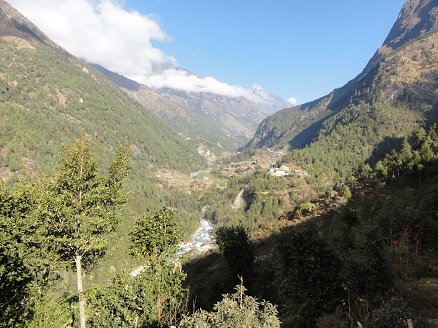 - The main valley which is covered by the Khumbu glacier and gives access to the Everest Base Camp at the feat of the ice fall and to Kala Pattar, a trekking top at 5550 m which is the best view point to the Everest. - The Gokyo valley and its beautiful lakes. It is covered by a glacier. Going up also gives a very nice view to the Everest. - At the extreme West the Thame valley which separates in 2 parts, the way to the Nangpa La which is the frontier with the Tibet, the way to the Tashi Lapsa, a very technical pass to the Rolwaling area. 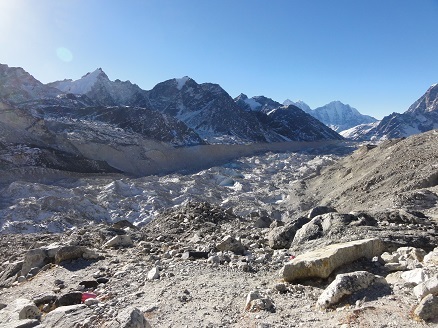 Those 4 main valleys are separated by 3 high passes, respectively the Kongma La at 5535 m between Chhukkung and Lobuche, the Cho La at 5420 m between Lobuche and Gokyo then the Renjo La at 5340 m between Gokyo and Marulung up to Thame. 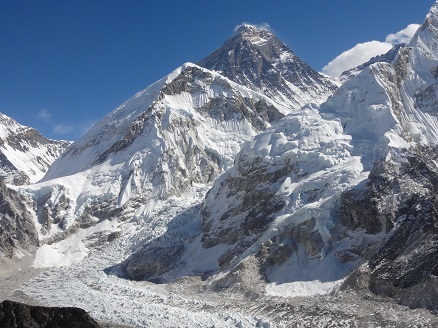 The Everest region includes four of the 8000 m tops, Everest (8848 m), Lhotse (8516 m), Makalu (8462 m) and Cho Oyu (8201 m). 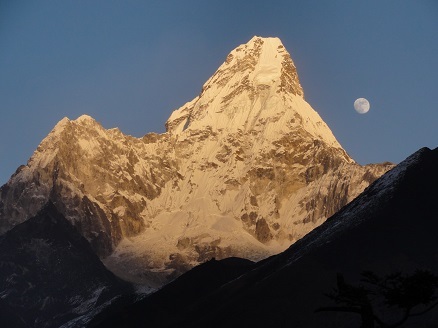 The Sagarmatha National Park is very varied for those interested in flora and fauna. Treks in these region cross spectacular forests of rhododendrons, in flours during March-April, of blue pine trees, of firs, of junipers and of many other kind of trees. 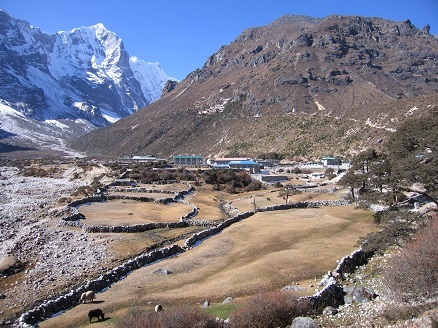 From October to March the Khumbu is dry and brown and in contrast during the moonsoon from June to September the greenery is surprisingly intense. Gentians, primroses, edelweiss and mountain poppies are common. 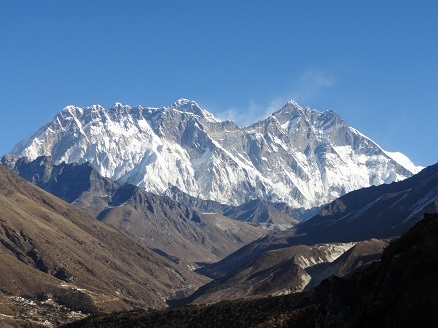 Sherpas have been the first people who have leaved the Khumbu. They are Tibetan people coming from an eastern area of the Tibet callad Kham. They possibly escaped from the Mongol incursions. They crossed the Himalaya and entered in the Khumbu by the Nangpa La. This route was later intensively used during the invasion of the Tibet by Chineese. As Buddhist, Sherpas view life as an endless cycle of rebirth into a world of suffering. Escape is possible only by accumulating a series of good lives, and this is the only way to reach the nirvana. All forms of life are respected and killing something is regarded as one of the greatest demerits. However, eating meet is no sin as long as the consumer was not responsible for the death of the animal. There is no caste system as in India. Sherpanis are treated equally to Sherpas and in most cases control the family finances. Although crowds of foreigners come each year, they seem to have protected their culture very well. Their mountaineering exploits since 1920s put them under the spot lights. Some of them are well known every where in the world, like of course Tensing Norgay (1st on the Everest with Edmond Hillary), Pemba Dorjie (8h10 to reach the summit from the Everest base camp), Apa Sherpa (21 times on the top). As usually in Nepal, staying in the valleys do not present any difficulties. Climbing the trekking tops, Chhukkung Ri and Kala Pattar at 5550 m, needs to be well acclimatized. Crossing the high passes, Kongma La, Cho La and Renjo La needs a good fitness and mild weather. 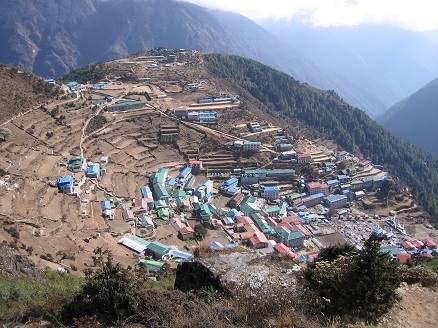 People landing directly at Lukla (2850 m) should spend at least 1 night around Phadking (2610 m) before reaching Namche (3450 m) and should spend 2 nights in Namche before going to a higher altitude. 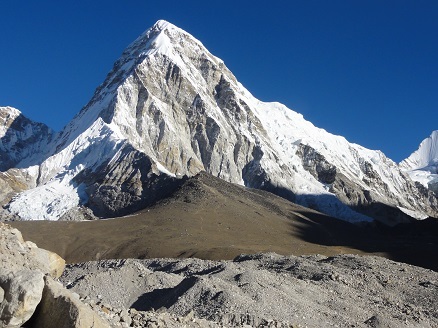 For the direct route, the next 2 nights stop must be at Tengboche (3860 m). 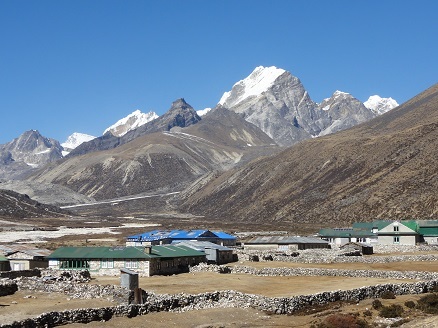 From Tengboche, a good option is to stay 1 night at Pheriche (4240 m) and 1 night at Dingboche (4400 m). In total it is minimum 7 nights, 8 being better. After this ascent rate, sleeping at Chhukung (4730 m) or Lobuche (4910 m) should not create any problem. Then crossing the high passes, Kongma La (5535 m), Cho La (5420 m) or Renjo La (5340 m) should also be fine as the nights before and after each pass are more or less at the same altitude. There are two main options for getting there. The first one is to take a bus from Kathmandu to Jiri then to hike 5 to 6 days from Jiri to Lukla. The second option is to take a direct 40 mn flight from Kathmandu to Lukla. Take care that sometimes flights do not operate for some days due to bad weather conditions, fog or wind. The best periods to go are November and December, it is getting colder and colder but drier and drier which usualy means clear weather. Then March to May is another good period but more hazy and sometimes cloudy. The driest month of the year is December. 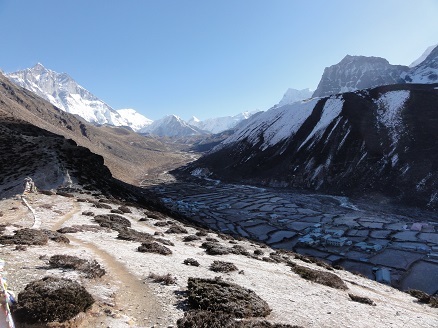 The entry of the Sagarmatha National Park just after Jorsale is subject to a fee. No special permit is required except the TIMMS card.